Below are current "In the News" articles appearing in various newspaper website(s) covering topics of interest in and around North County Fire EMS. Also included are "Media Releases" directly from the desk of North County Fire EMS's Fire Chief, outlining current and breaking news items as they pertain the department. Media Releases are compiled in a document format commonly referred to as PDF. As such in order to view the Media Releases, there will need to be software installed on the computer/device, capable of opening/reading such documents. 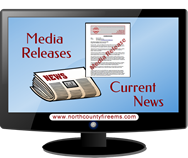 North County Fire / EMS provides links to news and opinion articles as a service to our readers. Often these articles come from sources outside of our organization. Where possible, the author and the source are documented within each article. Statements and opinions expressed in these articles are solely those of the author or authors and may or may not be shared by the staff of North County Fire / EMS.